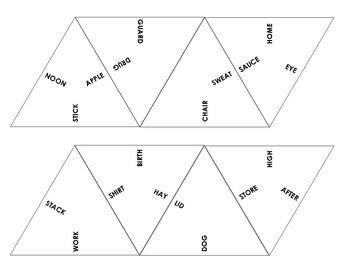 Tri-angles is a challenging compound word puzzle for a small group of students. 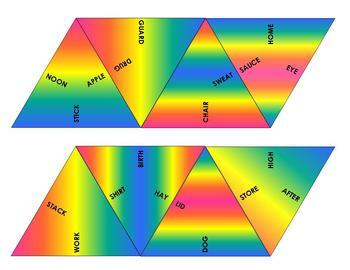 Working to piece the colorful triangles into one large triangle will prompt discussion of the possible compound words that can be made with each base word, exposing students to many more combinations than the 40 actually included in the puzzle. 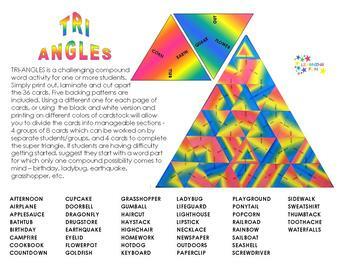 The color version is sure to attract student interest, but a black and white version (no rainbow background on the triangles) is also included. Color coded backs (color version) or cardstock (black and white) makes it possible to divide the puzzle up among 4 students/groups of students.